One sock without its match can’t be used for its intended purpose, but it can, we discovered, be used for a cause even greater than warming our toes. Thus, the SheKnows Where The Other Sock Went campaign was born. Our mission at SheKnows is to make a difference in the lives of families and children across the nation who are affected by autism by spreading the word about the disorder. Through this campaign, we strive to motivate others to get involved and communicate that no one is alone. With each advancement in technology comes a new challenge, and the invention of the washing machine was no different. Hundreds of thousands of socks have since gone missing, leaving laundry-doers everywhere baffled — and socks companionless. SheKnows now holds the answer to the age-old mystery of “Where’s the other sock? !” with its latest campaign: SheKnows Where the Other Sock Went. SheKnows has partnered with Grammy Award-winning singer and advocate for the Autism Speaks organization, Toni Braxton. In addition to being the face of the 2012 SheKnows Where the Other Sock Went campaign, Braxton is also the model for an original couture gown, designed and constructed out of all those “missing” socks by her longtime friend and couture designer Michael Costello, most recently seen in Lifetime’s Project Runwayseasons eight and nine. The one of a kind sock dress was revealed during New York’s celebrated Fashion Week in early February. From there, the dress will tour the nation in an expanded effort to spread awareness. In June during an elegant night of fashion in Los Angeles, the dress will be auctioned off to benefit of Autism Speaks. The SheKnows TV team has been documenting the entire creation process of this campaign from inception to its anticipated completion, which includes interviews with all partners and charity/foundation executives, as well as with the SheKnows team. Stay tuned for this inspiring documentary video’s release. ENTER TO WIN the pair of Jimmy Choo heels that Toni Braxton wore to the photo shoot, autographed by Toni Braxton, Nigel Barker and Michael Costello! The lucky winner will also receive a piece of the signature Autism Speaks jewelry collection. As a fashion, beauty and entertainment mogul, this fashion photographer gained worldwide recognition after his success on America’s Next Top Model. He is involved in an array of projects including photographic exhibitions, international editorial assignments and his own show The Shot on VH1. Nigel Barker’s presence in the worlds of fashion, beauty and entertainment has resulted in an array of projects including photographic exhibitions, international editorial assignments and his own show,The Shot on VH1, spawned after his success on the renowned series America’s Next Top Model. Michael Costello, who recently appeared on Project Runway: All Stars and is a close friend of Toni Braxton, partnered with SheKnows to devote his time to constructing a one of a kind dress made entirely of socks. The dress was revealed at the “SheKnows Where The Other Sock Went” event during New York’s celebrated Fashion Week. In 2012 Costello was the runner up in Project Runway: All Stars. Toni Braxton is a six-time Grammy Award-winning singer with more than 40 million albums sold worldwide. She has appeared on two Disney Broadway shows, A Change in Me and Beauty and the Beast, during which her role as Belle marked the first (and only) time a black woman performed as the leading character of the show. Most recently, Braxton is enjoying success with Braxton Family Values, a reality show on the WE network. Toni has had an unyielding passion for Autism Speaks since her son Diezel was diagnosed with autism in 2003. On Feb 10, SheKnows hosted an exclusive star-studded event during New York Fashion Week unveiling the sock dress and the print ads featuring Toni Braxton wearing the sock dress. The exclusive Autism Speaks jewelry line from Addison Taylor Fine Jewelry was also revealed. The 11th annual Walk Now for Autism Speaks event took place in West Palm Beach, Florida, on Sunday, March 4, 2012 as more than 7,000 people gathered to help raise awareness for autism. Co-founders Bob and Suzanne Wright addressed the crowds with a motivating speech, while supporters from the Florida community and beyond lined the sidewalks with booths that provided both entertainment and education about the disorder. 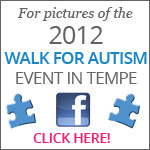 Walk Now for Autism Speaks is the nation’s largest grassroots autism walk program. Teams or individuals can participate in walks across the U.S. and raise money for the charity. On October, 28, 2012, SheKnows sponsored the Tempe, Arizona Walk Now for Autism Speaks, an event that raised nearly $1million for autism research and awareness!